Vida Y Hechos Del Ingenioso Hidalgo Don Quixote De La Mancha: Con Muy Bellas Estampas Gravadas Sobre Los Dibujos de Coypel, Primer Pinto de el Rey de Francia. En Haia [The Hague]: Por P. Gosse y A. Moetjens, 1744. 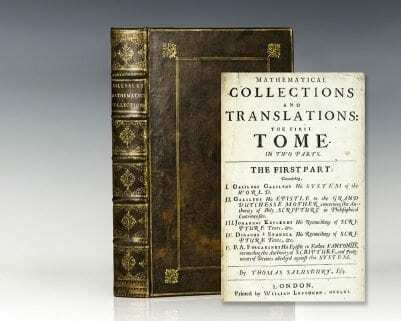 Rare early printing and one of the most highly coveted editions of Cervantes’ masterpiece. Octavo, 4 volumes, bound in full calf, gilt titles and elaborate gilt tooling to the spine, burgundy spine labels, triple gilt ruled, marbled endpapers, all edges red, ribbons bound in, with numerous engravings after the drawings of Antoine Coypel, renowned for the paintings he produced for King Louis XIV of France including those decorating the ceiling of the Royal chapel at Versailles. In near fine condition. An exceptional example. Don Quixote tells the tale of a man so entranced by reading about the chivalrous romantic ideals touted in books that he decides to take up his sword and become a knight-errant himself, with the aims of defending the helpless and warding off the wicked. With his somewhat confused laborer-turned-squire, Sancho Panza, they roam the world together and have adventures that have haunted reader's imaginations for nearly four hundred years. 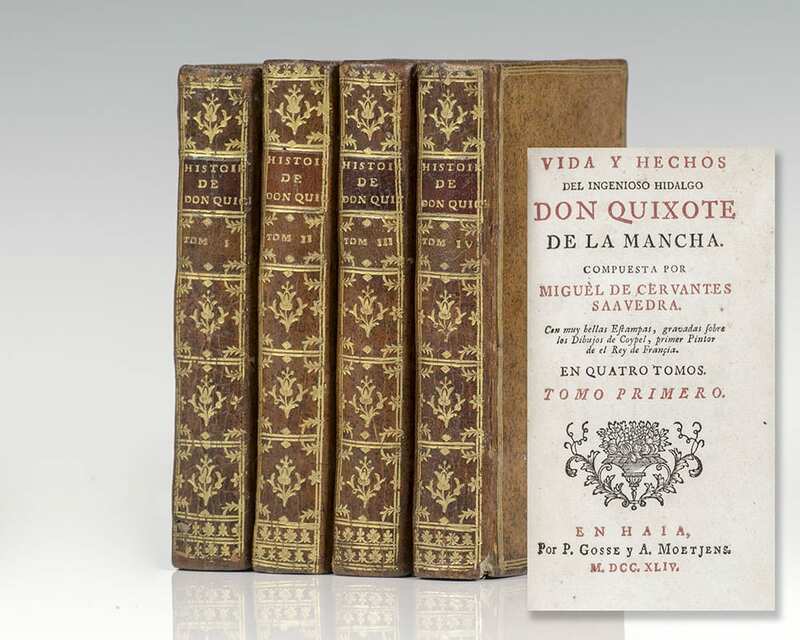 Don Quixote is generally recognized as the first modern novel. Over those years, it has had an incredible influence on thousands of writers, from Dickens to Faulkner, who once said he reread it once a year, "just as some people read the Bible". Vladimir Nabokov said of the book: "Don Quixote is greater today than he was in Cervantes's womb. [He] looms so wonderfully above the skyline of literature, a gaunt giant on a lean nag, that the book lives and will live through [his] sheer vitality... He stands for everything that is gentle, forlorn, pure, unselfish, and gallant. The parody has become a paragon." Cervantes Saavedra, Miguel de . Madrid: Don Joaquin Ibarra, 1780. The deluxe illustrated Ibarra edition of Cervantes’ masterpiece “which is to Spanish literature what Shakespeare is to English” (Bloom). Quartos, 4 volumes. Bound in full contemporary Spanish tree calf with gilt titles and tooling to the spine, red morocco spine labels, gilt ruled borders, marbled endpapers, all edges green, engraved frontispiece to each volume and 31 engraved plates throughout, 2-page folding engraved map of Don Quixote‘s travels to the rear of volume 1. Spanish printer Joaquín Ibarra made several important technical developments in press printing, book-making, typography and paper-making. In his printed work, Ibarra sought to achieve a perfect flow of harmonious type, inks, illustration, margins, and textures. He worked with the best painters and engravers of his time and, based on a secret formula he developed, the Ibarra ink gained a reputation for its exceptional quality and brilliance. The present volume was printed on “ex profeso” paper with melted types of “ex novo” on the pages, both of which Ibarra created in his Madrid workshop specifically for this project. In near fine condition with bookplates to the pastedown of each volume from the Royal Military College, small library stamps. 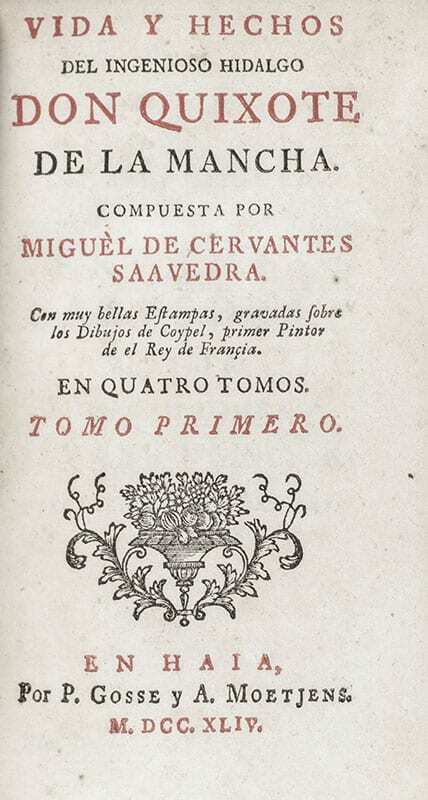 An excellent example of both Cervantes’ and Ibarra’s best-known works. The History of the Most Renowned Don Quixote of Mancha: And his Trusty Squire Sancho Pancha, Now Made English according to the Humour of our Modern Language. And Adorned with several Copper Plates. London: Printed by Tho. Hodgkin, and are to be sold by John Newton, 1687. 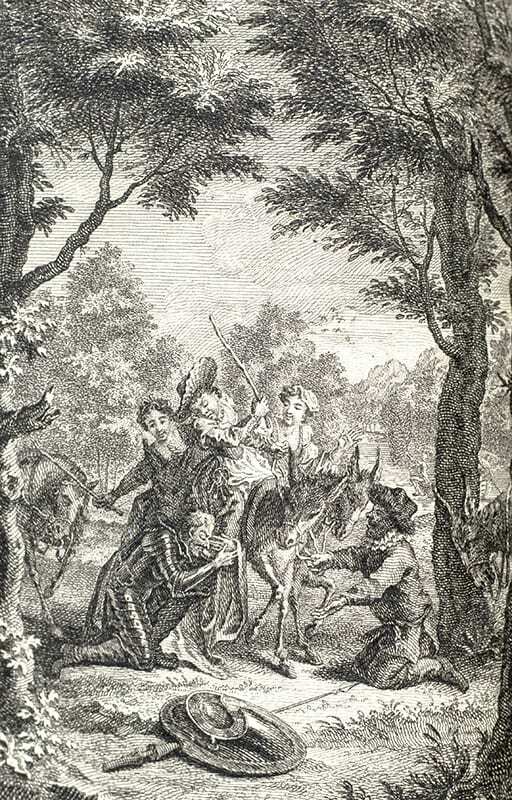 First edition of the first illustrated edition in English of Don Quixote. Folio, bound in three quarters calf over marbled boards, gilt titles to the spine, raised bands. 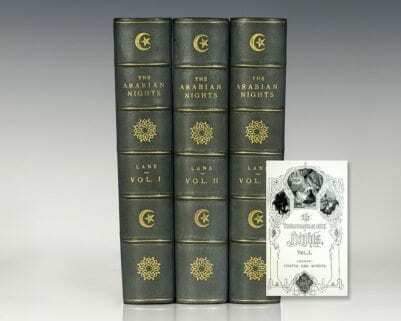 With copper-engraved frontispiece and eight copper-engraved plates, each bearing two images. 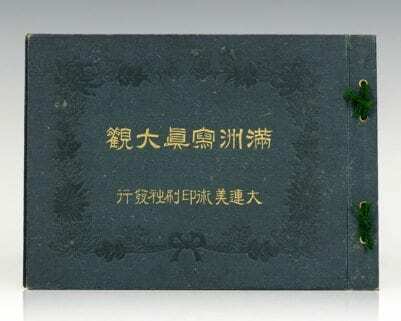 Translated by John Phillips. In very good condition with all plates present. In near fine condition. An exceptional example. London: Printed for F. and C. Rivington, T. Longman, B. Law, G. G. J. and J. Robinson, 1792. Early example of Cervantes’ masterpiece. Octavo, 4 volumes. Bound in full contemporary calf, gilt titles and tooling to the spine, burgundy spine labels, engraved frontispiece to each volume, illustrated. Translated by T. Smollett. In very good condition, armorial bookplates. 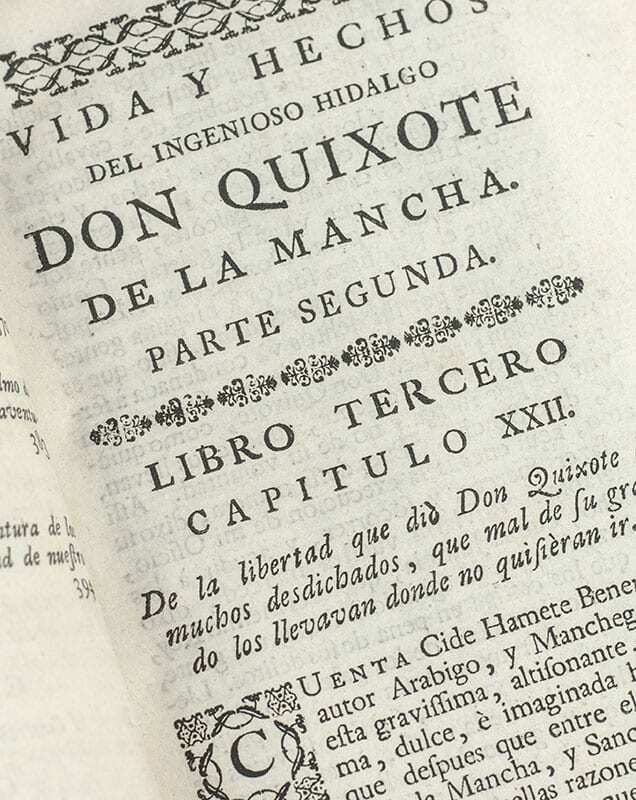 A nice example of an early edition of Don Quixote. The deluxe illustrated Ibarra edition of Cervantes’ masterpiece. Quartos, 4 volumes. Bound in full 19th century green morocco with central motif and cornerpieces stamped in blind to the panels, gilt titles and tooling to the spine, elaborate double-ruled gilt borders, marbled endpapers, all edges gilt, engraved frontispiece to each volume and 31 engraved plates throughout, 2-page folding engraved map of Don Quixote‘s travels to the rear of volume 1. Spanish printer Joaquín Ibarra made several important technical developments in press printing, book-making, typography and paper-making. In his printed work, Ibarra sought to achieve a perfect flow of harmonious type, inks, illustration, margins, and textures. He worked with the best painters and engravers of his time and, based on a secret formula he developed, the Ibarra ink gained a reputation for its exceptional quality and brilliance. The present volume was printed on “ex profeso” paper with melted types of “ex novo” on the pages, both of which Ibarra created in his Madrid workshop specifically for this project. In near fine condition. A superior example of Ibarra’s best-known work.